Announced on Monday, Starbucks employees can go to college for free as the company will now foot the bill for four years of tuition. CEO Howard Schultz said in a statement that the Seattle-based coffee retailer would be expanding its benefits for tuition and cover the full cost of a Bachelor’s degree from Arizona State University’s online program. The company will invest a total of $250 million over the next 10 years to help full-time and part-time employees graduate college. The coffee giant will also reimburse employees more quickly, paying them back on a semester basis instead of waiting until the employee completes 21 credits — roughly the equivalent of one year. Before, Starbucks' education program had only paid for employees’ final two years of college, while freshmen and sophomores were offered financial aid and partial scholarships, The Seattle Times reports. Starbucks' increased tuition support is all part of its larger goal of graduating 25,000 employees by the year 2025 as it aims to alleviate student debt. While the average cost at ASU Online totals $60,000, the university is also underwriting costs. According to the Times, ASU offers Starbucks employees a scholarship that covers 42 percent of its online program's tuition, which normally averages around $15,000 per year. Since Starbucks launched its “Starbucks College Achievement Plan” in conjunction with ASU last fall, nearly 2,000 employees have enrolled in the program. 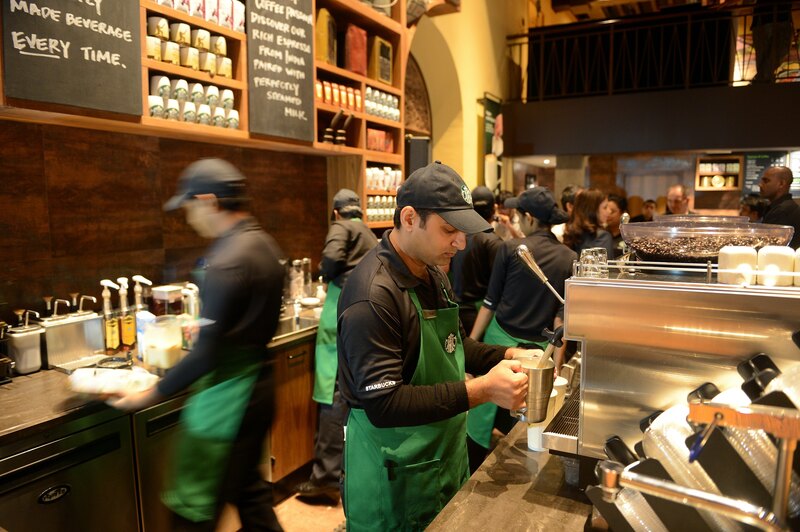 According to Reuters, nearly 80 percent of Starbucks' workforce of 140,000 is eligible for enrollment. To be eligible, employees must work at least 20 hours per week. Employees are not required to complete their degrees and do not have to remain at the company past graduation. Efforts such as this college program are part of Starbucks' attempt to engage the company in matters outside of coffee. Just last month, the company attempted to broach the issue of race by having baristas talk to customers while they were making their drinks, but Starbucks' "Race Together" movement was widely criticized. The endeavor largely fizzled, and the event that had baristas write “Race Together” on cups was abandoned after just one week. Compared to the Race Together idea, which was as half-baked as it gets, this idea is a home run on several levels. It’s a big bounce back for Starbucks. As college tuition costs continue to skyrocket across the country, it’s clear this announcement is more than just a home run for Starbucks. In the 2014-2015 school year, average college tuition rates have gone up by 3 percent, according to USA Today. Even if Starbucks gets a PR boost for its generosity, at the end of the day, the students are the ones who will reap the biggest rewards.